← Why are farmers still killing cheetahs in Namibia? The weights and head plus body length of all the wild cats are shown here in a spreadsheet and charts (update 2011: Scroll down to see tiger weight spreadsheet). Weight also translates to size. I have used weights as a measure of size as well as length as they are probably more precise. Although certain wild cat species are slender and rangy such as the serval. The actual figures are set out below and if you scroll down a bit you can see the charts on weights and length. Important: at the base of the spreadsheet below you will see links to other sheets. Please click on these to see more information and graphs on wild cat species by size. Please note that in respect of weight and size assessments, some of the sample sizes are small and some lengths were taken from preserved skins. This will account, I suspect, for any slight variation between weights and lengths. Note too that the internet provides a wide range of maximum weights of lions and tigers. This is probably because hard data from actual weighings are hard to find and there tends to be exaggerations. The source for the data on this page is the much respected Wild Cats Of The World by Mel and Fiona Sunquist ISBN-13: 978-0-226-77999-7. Please click on sheet 5 and charts 1-3 links at the base of the above spreadsheet. 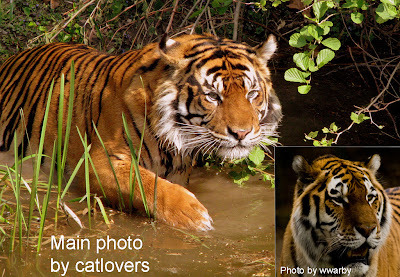 Tiger – largest wild cat species. What is interesting is how the wild cat weights (a) vary a lot between cat to cat and (b) there is a wide weight range within a single species. The wide range of weights within a species of wild cat is usually found in those species that occupy wide ranges. And some wild cats occupy enormous ranges (geographic distribution) such as the puma (cougar), which occupies the biggest range of any terrestrial mammal in the western hemisphere (see Puma Cat Range). The wide distribution translates to a variety of prey availability and size, which dictates the size of the wild cat. Another example is the jaguar. Male jaguars in Venezuela are almost twice the weight of those in Belize (104 kg to 56 kg). 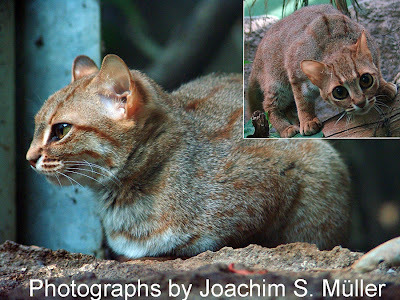 The bottom three cats are the smallest, with probably the Rusty-spotted cat (pictured above) the smallest of all wild cat species but there is not a lot of research so the figures for the rarer wild cats are open to amendment. In lbs (pounds) the smallest of the small wild cats recorded (src: Wild Cats of the World) weighed 1.76 pounds (Rusty-spotted cat) and the biggest of the tigers according to this book weighed 705 pounds, which is 400 times heavier! See Largest Domestic Cat Breed for a discussion on domestic cat breed weights. A comparison of wild cat species by size, is, I think, interesting. Individual cat species in general vary enormously in size. At one time the large variation in size of the leopard resulted in scientists deciding that forest dwelling leopards were a different species to those that lived with the savanna. Tigers in Asia, in such countries as Sumatra, are considerably smaller than the Siberian tiger for instance. The average maximum weight of wild cats in South America is much lower than Africa and S.E. Asia – see page. Wild Cat Species by Size — 1 kilogram = 2.20462262 pounds by the way! This entry was posted in Wild Cat Species and tagged cat anatomy, largest cat, wild cat species, wild cat species by size by Michael Broad. Bookmark the permalink.